Hong Kong – As the one-year countdown celebrations for the 2008 Olympics came to a close in Beijing, eight Tibetan independence activists were deported to Hong Kong. Six of the activists had been arrested yesterday for unfurling a protest banner on the Great Wall of China. The two others were Lhadon Tethong and Paul Golding, who were detained by Chinese police in Beijing at approximately 2pm Beijing time today. Ms. Tethong, a Tibetan and Executive Director of Students for a Free Tibet, has been openly reporting for the past week on China’s Olympics-related propaganda on her blog, www.BeijingWideOpen.org. In many cities around the globe, Students for a Free Tibet members announced news of the activists’ release to relieved Tibetans and supporters gathered for demonstrations that are part of an “International Day of Action” to mark the one-year countdown to the Beijing Olympics. Demonstrations are taking part today in at least fourteen cities, from Vancouver to New York, New Delhi to Cape Town. 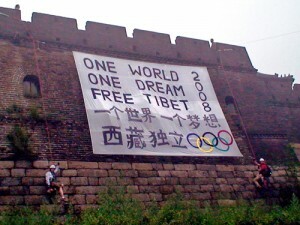 The six activists were detained on the eve of the one-year countdown for unfurling a 450-square foot banner on the Great Wall of China that read “One World, One Dream, Free Tibet 2008” in English and Chinese. During the two-day detention, the whereabouts of the British, Canadian, and American activists remained unknown. Dorjee and four other Americans were held by Chinese authorities for two days in April after a protest on Mt. Everest against China’s plans to summit the mountain as part of the Olympic torch relay. Tibetans and their supporters have vowed more protests during the torch relay next year. Students for a Free Tibet (SFT) is a network of young people and activists campaigning for Tibetan independence, with 650 chapters in more than thirty countries worldwide. SFT is based in New York, with offices in Vancouver, London, and Dharamsala, India.